The Padded Harness Vest is made of two layers of weather resistant, 1000 denier nylon/urethane coated fabric. The inside of the vest is padded for your dog's comfort. All seams are bound and reinforced for added strength and durability. There is a Hook and Loop closing, clear vinyl pocket for your ID. The Handle is covered with reflective webbing for added visibility and safety. 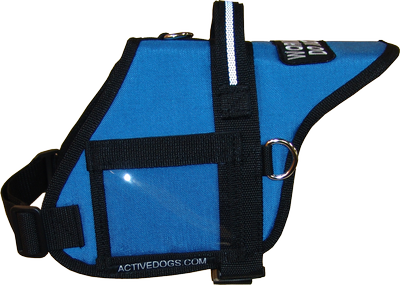 The vest fits over the dog's head and attaches with a wide, quick release buckle on the adjustable girth strap. The front chest strap has slides for two-way adjustment. This vest has three heavy metal welded D-rings. The top D-ring can be used to attach your leash. The D-rings on each side of the vest enable you to use this vest for pulling/carting. The vest comes with 1 patch of your choice (regular patches, not specialty patches). Standard placement is on the back, please specify if you would like it placed elsewhere.